January 18, 2016 - No Comments! Email marketing can seem daunting at first but when done right it can be an extremely powerful marketing tool. You’re probably doing some form of email marketing already be it a newsletter, auto responder series or a full fledged campaign but making sure you’re getting the most out of it requires some thought. There are many small (and big) mistakes you can make when managing an email campaign that not only affect your return on investment but has the potential to damage your brand. The aim of this list is to help you get the most out of your email marketing efforts and avoid some of the common pitfalls marketers and business owners face. First things first - if you’re not collecting emails you’re missing out. Email marketing is yet to be replaced by social media. The return on investment using email marketing is considerably higher (US Direct Marketing Association says as high as 4,300%) and customer acquisition much more effective than Facebook and Twitter. The fix: Get a signup form in a prominent position on your website and offer an incentive (eg. 25% off on your first meal on us if you sign up to our newsletter). Your want to grow your list of emails so use your social channels to point people to your signup form. You also want to make sure you make it easy for potential customers to sign up so only collect what’s necessary. Click-bait-y, non-relevant, misleading or plain boring subject lines will hurt your email open rate and inevitably your customers trust in your business. 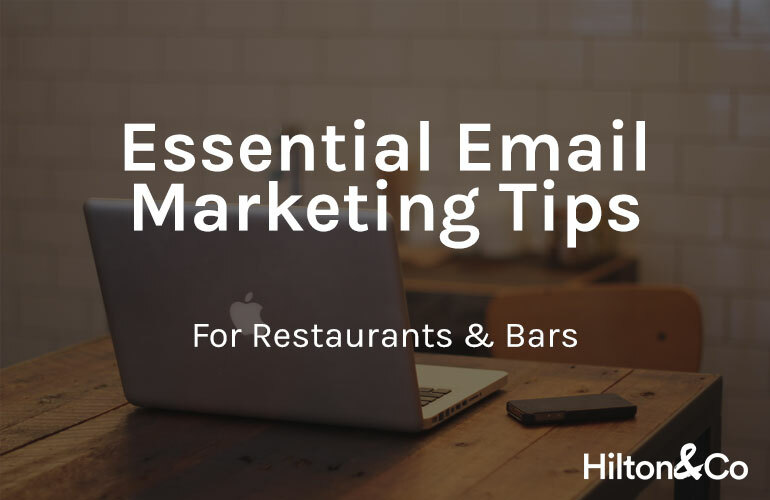 The subject line is one of the most important parts of your email (if not the most important) as it’s the deciding factor to whether your customers will open your email or not. Don’t try to lure them in with sensational statements or offers with hidden terms and conditions. The fix: This is your chance to stand out in your customer’s inbox. Try to make your subject lines compelling and relevant. You want to offer value and grab their attention. On mobile and some email clients a preview of the message is displayed after the subject line. Often called the pre-header this is taken from the first paragraph of your email but depending on what email marketing software you’re using you could take advantage of this preview to elaborate on your subject line. The fix: Use the pre-header to supplement your subject line and give your customers another reason to open your email. If your customer can’t recognise the name or email address which you’re sending your email from it will decrease the likelihood of them opening it in the first place. It also makes you look unavailable and is a missed opportunity to engage with your customers. The fix: Make it easy for your customers to get back to you with questions or comments. You might even want to add a personal touch and have your name as the “from name” when sending out emails to your customers and encourage them to get in touch with you. New subscribers are most engaged within 48 hours of signing up, not taking advantage of this is a huge mistake. You’re more likely to lose your customer’s interest if you dismiss to interact with them within this initial period. The fix: Set up an automated email for new subscribers to your mailing list to remind them why they’re on there. This is also a great opportunity to send them an introductory offer or discount as a thank you for signing up. You only have a few seconds to grab your customer’s attention once they open your email. If you’re not giving them something they might want you’re immediately prompting them to either close or delete your email (or worse yet, unsubscribe). The fix: Keep your content relevant and engaging and offer them something they are interested in. Give your customers content they want to read and share with their friends and ultimately, bring them into your venue. This is an all too common mistake; you’re only sending emails when you have something you want to sell or promote. Your customers will unsubscribe to your newsletter as soon as they realise all you want to do is get their money. The fix: Of course the end goal is to convert your email subscribers into paying customers but to do so you have to build a relationship. It’s about trust so don’t go straight in for the sale - provide your newsletter subscribers with valuable content. People want to know there’s a person behind the email, not a robot. If you sound like a machine in your emails you’ll quickly see subscriber numbers dwindle. Don’t be too formal, they’ve given you their email so you’re basically on first name terms already. The fix: Don’t be afraid to let your personality shine through when writing your newsletter. Write in a conversational or casual manner, your customers will appreciate knowing a real person wrote to them and it’ll give you a better chance to connect. Too many, contradicting or no calls to action is a conversion killer. You don’t want your customers to get confused as to what you’re offering so keep it simple. The fix: Focus on one clear, actionable and obvious call to action. Repeat the CTA throughout the email and don’t be afraid to ask your customer to take action because if you don’t, they won’t. Up to 70% of all emails are opened first on a mobile device like a smartphone or tablet so having a newsletter that’s not designed to fit on smaller screens will result in poor performance. The numbers don’t lie, a study shows that 41% of users would either close or delete an email if it’s not optimised for mobile devices. The fix: Make sure you opt for a responsive template when designing your newsletter. Keep your font size legible and follow iOS guidelines for button sizes. Refrain from using too many images when displaying important information as many email clients (especially on mobile) has images turned off by default. Not integrating social media into your emails is another missed trick. Not only do you want to drive traffic to your social channels but encourage your customers to share your content on theirs. The fix: Send content you want your customers to share and make it easy for them to do so. Include a link to a web version of the email you’re sending and provide them with social buttons to make it easy to share on their favourite social networks. You don’t want to be sending your customers emails every single day as they will inevitably get annoyed and unsubscribe. On the other hand you don’t want to send a newsletter every 6 months and give your customers enough time to forget who you are or why they signed up in the first place. The fix: To find the sweet spot you’ll have to send emails and test whatever works best for you. Additionally, don’t be afraid to ask your customers. Send a periodical survey and ask them if they’d rather hear more or less from you. An all too common mistake made before starting an email marketing campaign or newsletter is not having a clear strategy. Whether it be to grow your email list, help your customers or drive visits to the venue you need to establish a goal prior to engaging. The fix: Write down what you’re looking to achieve. Keeping a clear goal will inevitably keep you a lot more focussed and gives you the tools to measure your success throughout the process. Forget the email “blast”, not all of your customers are the same. Successfully using segmentation (or the process of dividing your subscribers into categories or lists) to your advantage can make the difference between a great performing email campaign and a poor one. The fix: With most email marketing softwares there are many options available to you. Start small and work your way up. If you’re asking your customers for their location when signing up start by segmenting your list into local and non-local customers. That way if you’re having a limited lunch offer you can send it to the people you know are in the area and can take advantage of it. Did you ask for their birthday? Great, set up an automated email to wish them happy birthday and offer them something like a free dessert as a birthday present. You’re sending out a regular newsletter but are you measuring how it’s performing? Do you know if people are opening it or just deleting it as soon as they receive it? Do you know how many people are reading it and engaging with the content? If you answered no to any of those questions you might want to take a look at all the valuable information provided in your email marketing software's reports. The fix: The three most important things to look at are open rate, click through rate (also known as CTR) and unsubscribes. Your open rate will tell you how your subject lines are performing. Poor CTR? You’re not providing enough value or you’re not targeting your content properly. If a large number of people are unsubscribing then look at what might be causing it. Look at what point they’re unsubscribing and re-work potential emails or ways you present offers. No-one likes to receive unsolicited emails. The rules are simple, you’re only allowed to send bulk email to people who have specifically asked to be on your mailing list. Sending marketing emails to people who have not opted in to receive emails from you is against the Privacy and Electronic Communications Regulations and can result in a fine, so always make sure you ask for permission. The fix: Make it clear at signup what your customers might expect from you. Inform them about what you’re going to do with their email address once they give it to you, how often you’ll email them and what type of content they can look forward to. If you’re blindly sending out emails and just hoping people will enjoy the content you’re setting yourself up for disaster. Not taking into consideration the person reading it and what they’re interested in will unsurprisingly result in poor engagement. The fix: Pay close attention to what your audience likes and responds to. If a particular piece of content results in a high CTR or a lot of people are sharing it on social media consider creating more of the same. Take advantage of what your customers are engaging with and how and adjust your accordingly. You definitely don’t want to make it hard for people who do decide to leave your list. Don’t make them have to login, manage subscription preferences or fill out a questionnaire to unsubscribe. Chances are they’ll most likely just mark your emails as spam and forget about you. The fix: Make sure your customers can easily and automatically unsubscribe, no questions asked (but do give them the option to subscribe again if they clicked it by accident). There are many things to take into consideration when using email marketing but following the guidelines listed above will put you ahead of the competition. If you only take one thing away from this article let it be this; set a clear goal and test. Test the time and day you send your emails, test the design and layout, test subject lines, test content and test calls to action. To ensure the best possible outcome you have to test every aspect of your email campaign or newsletter. Don’t be afraid to try new things or to go back and change something if the results aren’t what you were hoping for. Still not happy with the outcome? Re-work and test again. If you found this article helpful or have any questions please let me know in the comments! Want to get more tips and tricks like these ones as well as a FREE report on the top 10 common mistakes restaurants and bars are making on their websites?